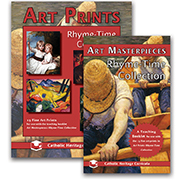 Art Masterpieces: Rhyme-Time Collection is designed to develop a young child’s appreciation for art and poetry. The 15 Art Prints included in the collection—by artists such as Millet, Homer, and Rubens—are presented alongside traditional children’s rhymes for the student to memorize. The detailed picture studies in the Teaching Booklet encourage close observation of the paintings and instill a recognition of beauty, composition, color, and line. Ages 5-7. Teaching Booklet: Softcover, black and white, 65 pgs. 5 1/2" x 8 1/2"
The most fundamental answer is that the experience of beauty in art helps to form the mind and heart for the pursuit of truth and goodness. As Prof. John Crosby has said, “the child who is raised to respond to the beautiful is thereby sensitized to all that is good and right and worthy.” Taking time to expose our children to great art gives them the opportunity “to contemplate the ray of beauty that strikes us to the quick, that almost ‘wounds’ us, and that invites us to rise toward God” (Benedict XVI).